Here’s a Horse Snake puzzle. Rules Shade some cells to form a snake which does not touch itself, not even diagonally. Head and tail are given. 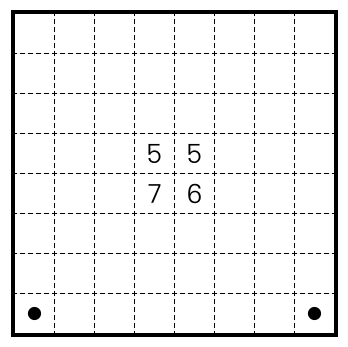 Clues indicate the number of shaded cells that are a knight’s step away from the clue. Clues can’t be shaded. This entry was posted in Puzzles and tagged hard, horse snake, snake, variant on 2016-05-25 by rob. Some quick notes on how to get the GP score tables into a useful shape, in order to be able to compute something like the below top 10 by best four results in the first five GPs (using preliminary results for GP 5). So I don’t have to figure this out again next time, and so you can play along at home. The scripts used to do this are available here. This entry was posted in Puzzles on 2016-05-21 by rob. We’re currently running a review series for the 2016 24 Hours of Budapest on croco-puzzle. I made this Anti-Knight Kakuro, a type which occurred in Tawan‘s set. It turned out to be a bit too hard. 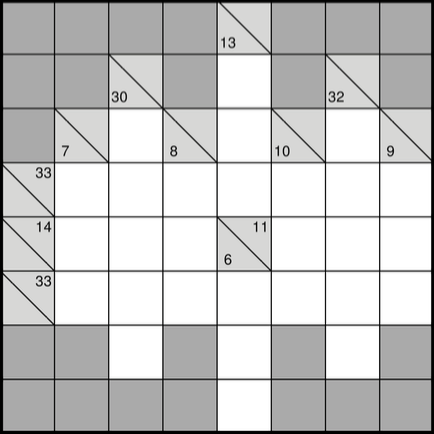 Rules Solve as a standard Kakuro. In addition, equal digits must not be a knight’s step away. 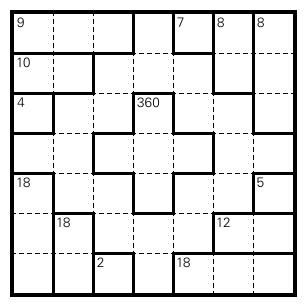 This entry was posted in Puzzles and tagged hard, kakuro, kakuro anti-knight, variant on 2016-05-19 by rob. Here’s a Checkered Fillomino, flowery theme. This entry was posted in Puzzles and tagged checkered fillomino, fillomino, medium on 2016-05-18 by rob. One more GP round over, with the US round last weekend. While we’re waiting for results, here’s a video recording of my solve. (I’ve been recording the last few, prompted by Endo Ken; GP round 4 where I did relatively terribly is still missing for technical reasons.) No idea where this puts me, but I should definitely work on my Slitherlink solving. This entry was posted in Puzzles and tagged video on 2016-05-17 by rob. One more Tom-tom puzzle. That’s it for the series. 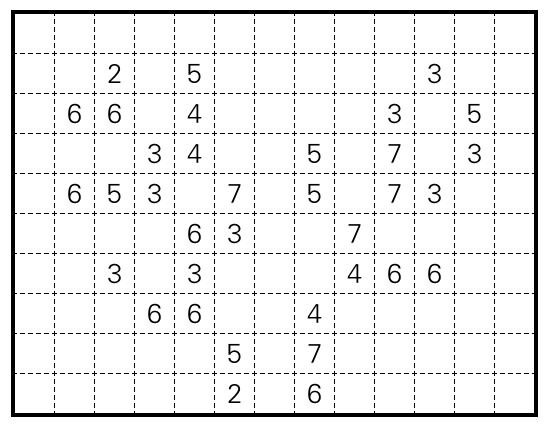 Rules Fill the grid with digits 1-7, so that no digit repeats within a row or a column. (Digits may repeat within rooms.) 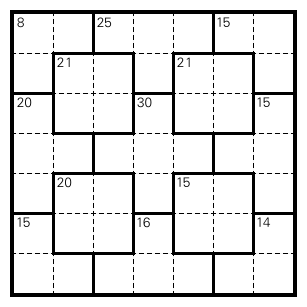 Clues indicate the result of applying a basic operation (addition, subtraction, multiplication, division) to the digits within that room, starting with the largest digit. This entry was posted in Puzzles and tagged medium, practice, tom-tom on 2016-05-13 by rob. This entry was posted in Puzzles and tagged hard, practice, tom-tom on 2016-05-12 by rob.